In science talk the galapagos giant tortoise is called the geochelone elephatopus, but in ordinary people talk, they are just called amazing! Spanish sailors who saw the saddleback tortoises thought they looked like a kind of saddle back home. That saddle was called a galapago, so they called the tortoise a galapago and called the islands where they found them the Galapagos Islands. Those nine islands in the Galapagos archipelago are part of Ecuador. You can see them marked on the map. The galapagos giant tortoise is the biggest tortoise in the world. The biggest ones can weigh as much as 300 kg. That's about 660 pounds. The tortoise also lives a long, long time. Some have lived for about 200 years. There are two kinds of galapagos giant tortoise. I already told you about the saddlebacks. They live on the desert islands like Espanola and Pinta. They have long necks that let them reach up high to eat plants. Their long necks can reach so high because their shells don't come down as low as other tortoise shells. That means they are in danger from other animals like dogs that can bite their necks even when they pull in their heads. The other kind of galapagos tortoise is called a dome back. That's because its back is in the shape of a dome. They live on islands like Santa Cruz and Isabela where there is lots of rain. The plants grow low to the ground and the dome backed tortoises don't have to reach up so high to get food. When a dome backed galapagos giant tortoise pulls in his head and front legs, he is well protected. His shell is strong and his front legs are covered with hard scales. The galapagos island tortoise doesn't need to drink much water. He can get most of what he needs from plants and dew. That's usually a good thing, but when European sailors were exploring, they caught the tortoises and put them on their backs on the ships. The tortoises would live a long time with no food and water. Then the sailors killed them to eat. Now there are not so many giant tortoises on the Galapagos Islands. After the tortoises mate, the female finds a some sandy ground and digs a hole with her strong hind legs. Then she lays 2-16 eggs in the hole. The eggs look like tennis balls. She plugs the hole with mud she makes from her pee. When the weather is cold, the eggs hatch as males. When it is warm, the eggs become female tortoises. 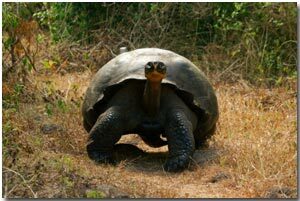 The galapagos island tortoise is in danger. You can help save them even if you don't live where they live. You can adopt a galapagos egg. You won't get to keep the egg, of course, but your donation can help to keep these special giants alive in their island homes.